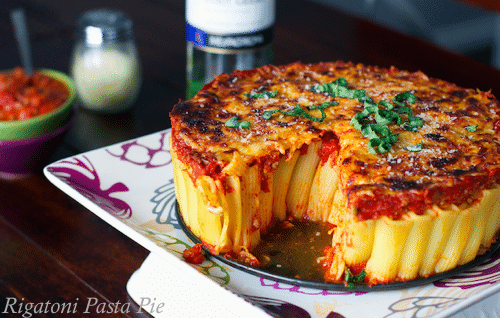 This might be the best rigatoni pasta pie ever! This impressive and savory pasta dish is perfect for entertaining dinner guests, and quick and easy to dish out for an ordinary family dinner. Packed with pasta, cheese, meat (substitute tofu, if you like) and sauce, expect everyone to ask for seconds.